How We Discovered This Book: When my writing partner Joanna was here for a visit, she entered my children in a drawing at our independent bookstore. My daughter Elizabeth won an autographed copy of this book. It begins where the famous poem “Casey at the Bat” ends (it’s in the back for reference if you need to refresh your memory). A girl pitcher is brought in to restore the team’s reputation, and she has some unorthodox methods for saving the day. 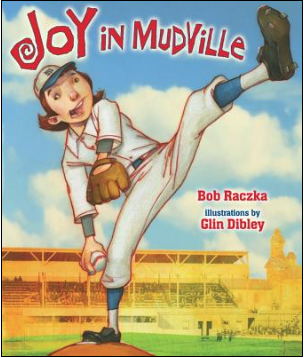 I like this book because a girl is the hero in a traditional boy’s sport. She comes to the rescue, but with her own way of doing things. Both my kids love this book, and it is on frequent rotation for reading before bed. It’s about a girl and baseball, which keeps them both interested. Read “Casey at the Bat” aloud – for the first time, or once again! Check out the National Baseball Hall of Fame & Museum in Cooperstown. If you’re nearby, plan a visit. Read the amazing recent story of Mo’Ne Davis, the female Little League pitcher who was the first girl to throw a shut-out game in Little League World Series history. She is also the first Little Leaguer on the cover of Sports Illustrated.